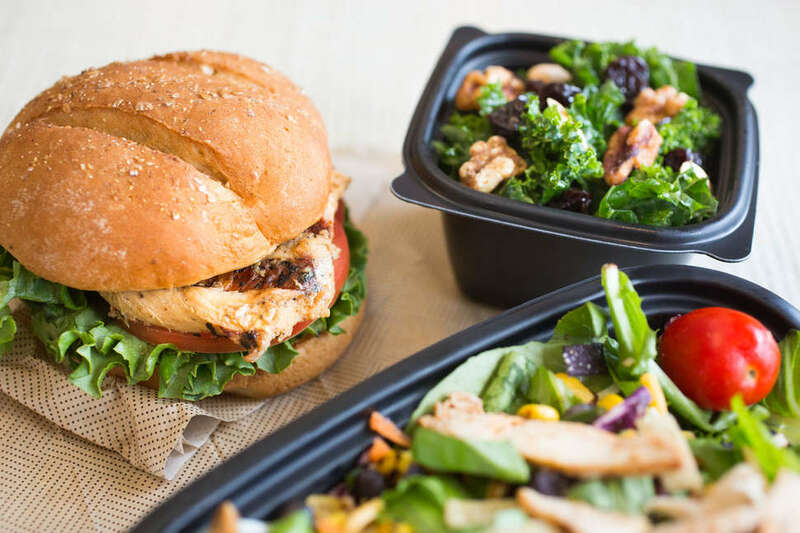 Good news fast food fans: Your healthy eating kick doesn’t have to be as sacrificial as you thought. You can still savor Chick-Fil-A even if you’re trying to commit to a wholesome diet in 2019. Unless it’s a Sunday that is. And unless you’re vegetarian, in which case you should just waffle fry binge and call it a day. Choosing grilled options and ordering the fruit cup filled with apples, mandarin oranges, and strawberries as a side -- be wary of sugar, though -- makes a healthy meal here possible. Because the menu is chicken-based, many dishes are high in protein and reasonable in fat content, especially the items that don't take a bath in the fryer. 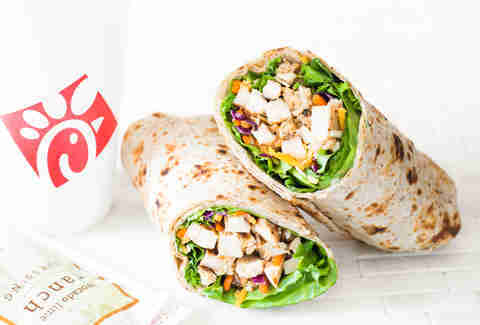 There are sandwiches, wraps, chicken nugs, salads, and soups galore on the menu that fit into your healthy lifestyle. We’ve taken calories, fat, fiber, and protein into consideration in choosing these picks. Here’s what to order. Yes, you can feel good about eating a Chick-Fil-A meal without throwing up the "cheat day" flag. Just go for grilled. 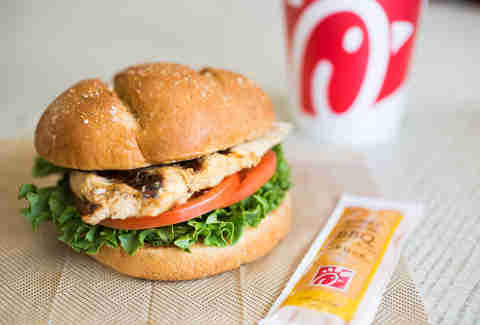 Seriously, Chick-Fil-A’s grilled chicken isn’t dry or rubbery, as many us fear when ordering it. To taste like your neighbor barbecued it on his backyard grill at a summer block party, it’s seasoned with lemon, sea salt, herbs, and garlic, and cooked in a high-tech grill engineered by the company that retains moisture and flavor. The boneless chicken breast, lettuce, tomato, and honey roasted barbecue sauce sandwich is just the thing to get you past your chick fix. Wraps get a bad rap -- yes they are stereotypically healthy in a basic and annoying way, but they also take all the best parts of a sandwich, make them the star of the show, and eliminate any unnecessary fluff. It’s time we appreciate them. Cut down on carbs by enjoying sliced grilled chicken, lettuce, carrots, and shredded Jack and Cheddar cheese stuffed into a flaxseed flour flatbread. And for those of you blanking on what a flaxseed flatbread is, it’s like a regular wrap tortilla but made with the omega-3 fatty acid- and fiber-packed grains. Ok, I’m with you: my first reaction to a grilled nugget wasn’t to ponder how delicious they could be. It was to wonder why such a thing exists. However, if you give these marinated morsels a chance, you might reconsider. Dunked in one (or all, we won’t hold you back) of Chick-Fil-A’s flavorful sauces -- the good old original, tangy Polynesian, honey mustard, zesty Buffalo, garlicky ranch, sweet barbecue, or spicy sriracha -- they’re not bland at all. They’re actually an exciting snack. This breakfast sandwich is healthy, tasty, and won’t leaving you with an empty stomach like a plain ol’ egg and cheese is wont to do. The classic winning combo of grilled chicken filet with a touch of lemony flavor, American cheese, and egg whites on a multigrain English muffin will leave you satisfied physically, emotionally, and dare I say spiritually. 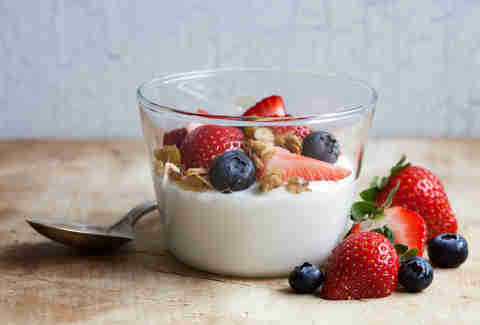 Pair with hot or iced coffee for a complete-feeling meal. The lowest cal salad option from Chick-Fil-A manages not to skimp on the good stuff. A variety of flavors and textures keep this dish exciting. Grilled chicken breast, crumbly blue cheese, granola, and roasted nuts top a bed of chopped Romaine with baby greens, shredded red cabbage, carrots, red and green apples, strawberries, and blueberries. A rare meatless option from the chicken-themed chain. Superfood is a vague term, but most agree that kale is one of them, which is the heart of this dish. 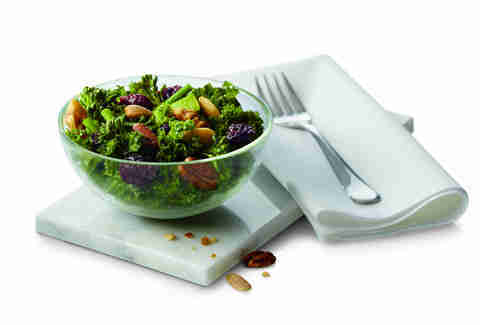 It includes a broccolini kale blend, maple vinaigrette dressing, chewy dried cherries, and a roasted nut blend. 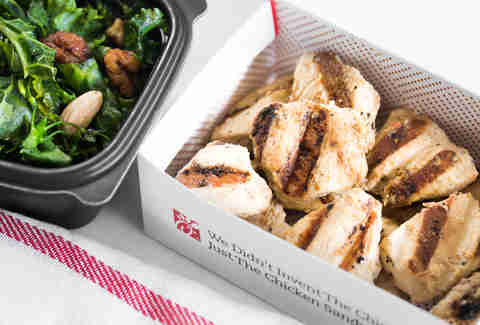 Hot tip: toss on some grilled chicken nugs for a protein boost. 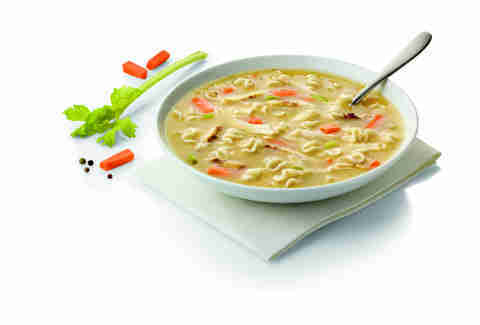 For a meal that’s healthy and heartwarming, opt for timeless chicken noodle soup. All the expected iconic ingredients make an appearance: shredded chicken breast, carrots, celery, and broth. It comes with Saltine crackers made so much better by dunking. Also, maybe don’t order this one to take in your car for the road. Despite being higher calorically and in fat than Chicken Noodle, Chicken Tortilla doubles down on fiber and protein. 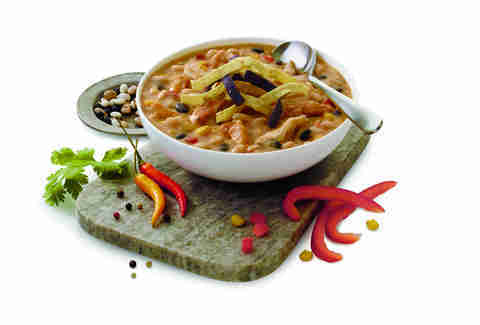 Spice up your soup order with aromatic flavors of garlic, cilantro, green chilies, red bell pepper, and paprika seasoning a creamy white soup filled with shredded chicken and navy, northern, and black beans. Of course, the highlight is the sprinkle of corn tortilla strip toppings. At this point, you've earned that tiny amount of carbs. Alex Erdekian favors fried chicken over grilled but is putting those feelings aside for the New Year.